"Houseboat Manufacturing Capital of the World"
Location of Monticello in Wayne County, Kentucky. Monticello is a home rule-class city in Wayne County, Kentucky, in the United States. It is the seat of its county. The population was 6,188 at the time of the 2010 U.S. census. Monticello advertises itself as "The Houseboat Capital of the World" due to the large number of houseboat manufacturers in the city. The city sits next to Lake Cumberland, and much of its economy is built on serving the recreational and tourist traffic to the lake. Max Wise of Campbellsville, Kentucky is the current Kentucky State Senator, representing District 16 which includes Wayne, Adair, Clinton, Cumberland, McCreary, Russell, and Taylor counties. The District 52 Kentucky House of Representatives seat is held by Ken Upchurch of Monticello. District 52 includes Wayne County, McCreary County, and part of Pulaski County. Monticello is located at 36°50′17″N 84°51′0″W﻿ / ﻿36.83806°N 84.85000°W﻿ / 36.83806; -84.85000 (36.838194, -84.850022). According to the United States Census Bureau, the city has a total area of 6.1 square miles (16 km2), all land. Monticello is located near the center of Wayne County at the intersection of state highways 92 and 90, on Elk Creek, a tributary of Beaver Creek, which flows westward into Lake Cumberland. Monticello became the county seat when the Wayne County was formed in 1800. The first Wayne County clerk, Micah Taul, named the town after the home of Thomas Jefferson. Joshua Jones, a surveyor and Revolutionary War veteran, laid out the town on thirteen acres owned by William Beard. By 1810, the population was twenty-seven people. An oil boom in Wayne County created an economic boost in the late 1800s. Drilling began in these local oil fields in the 1880s and was renewed in 1921-22. Electricity was available in 1905 and city water in 1929. Manufacturing dominated the economy from the late 1950s and 1960s until the late 20th and early 21st century. In 1973, Belden Corporation (wire and cable) employed 300 people; Gamble Brothers (wood products) employed 161 people, Waterbury Garment (clothing) employed 271 people, and Monticello Manufacturing (clothing) employed 240 people. All four of these companies no longer do business in Monticello. As of the census of 2000, there were 5,981 people, 2,508 households, and 1,635 families residing in the city. The population density was 984.3 people per square mile (379.8/km²). There were 2,730 housing units at an average density of 449.3 per square mile (173.4/km²). The racial makeup of the city was 94.63% White, 2.42% African American, 0.40% Native American, 0.28% Asian, 1.34% from other races, and 0.92% from two or more races. Hispanic or Latino of any race were 2.96% of the population. There were 2,508 households out of which 31.3% had children under the age of 18 living with them, 46.7% were married couples living together, 14.9% had a female householder with no husband present, and 34.8% were non-families. 31.7% of all households were made up of individuals and 16.0% had someone living alone who was 65 years of age or older. The average household size was 2.33 and the average family size was 2.91. In the city, the population was spread out with 25.0% under the age of 18, 9.7% from 18 to 24, 25.9% from 25 to 44, 21.9% from 45 to 64, and 17.4% who were 65 years of age or older. The median age was 36 years. For every 100 females, there were 88.9 males. For every 100 females age 18 and over, there were 84.5 males. The median income for a household in the city was $17,423, and the median income for a family was $24,460. Males had a median income of $28,638 versus $19,259 for females. The per capita income for the city was $11,855. About 29.2% of families and 34.1% of the population were below the poverty line, including 39.9% of those under age 18 and 35.4% of those age 65 or over. Doughboy Monument located on the Monticello town square, a tribute to World War I soldiers. Mill Springs Mill and Park - a water-powered overshot gristmill built in 1877 and still in operation today. Brown-Lanier House - Historic home associated with the Civil War Battle of Mill Springs/Logan's Crossroads. From 1900 until 2013 Monticello had its own school district independent of the surrounding Wayne County Schools. It was one of the smallest public school districts in Kentucky, averaging fewer than 600 students in grades K through 12. Monticello High School boys and girls basketball teams, nicknamed the Trojans and Lady Trojans, were notable, having participated in several Kentucky High School Athletic Association state tournaments, and produced numerous All-State players. The 1915 boys team was undefeated and claimed the state championship. The 1921 team was coached Hall of Fame Coach Edgar Diddle, who led them to the state tournament semi-finals. From 1957 until 1980, the Trojans were coached by KHSAA Hall of Fame coach Joe Harper who led them to seven district championships, six regional titles, and to the state championship game in 1960. The school district became insolvent in 2013 and was forced to consolidate with the larger Wayne County School system. 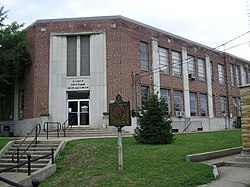 The school is now an elementary school within the Wayne County School system. ^ Commonwealth of Kentucky. Office of the Secretary of State. Land Office. "Monticello, Kentucky". Accessed 26 August 2013. ^ "Gregory is county's new senator: Higdon no longer represents Taylor County". Central Kentucky News-Journal. Retrieved August 27, 2013. ^ "PETROLEUM AND NATURAL GAS". ^ . Retrieved on August 30, 2018. ^ "Monticello's heartbreak: Tiny school mourning apparent end to a century of tradition". Lexington Herald-Leader. Retrieved August 30, 2018. 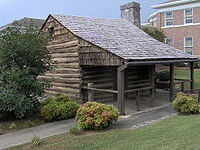 Wikivoyage has a travel guide for Monticello (Kentucky).